If you’ve accumulated unused, unpaid sick leave, you may be able to use it toward your NYSLRS pension benefit. New York State employees are eligible for this benefit. You also may be eligible if your employer has adopted Section 41(j) for the Employees’ Retirement System (ERS), or 341(j) for the Police and Fire Retirement System (PFRS), of Retirement and Social Security Law. Not sure? Ask your employer or check your Member Annual Statement. 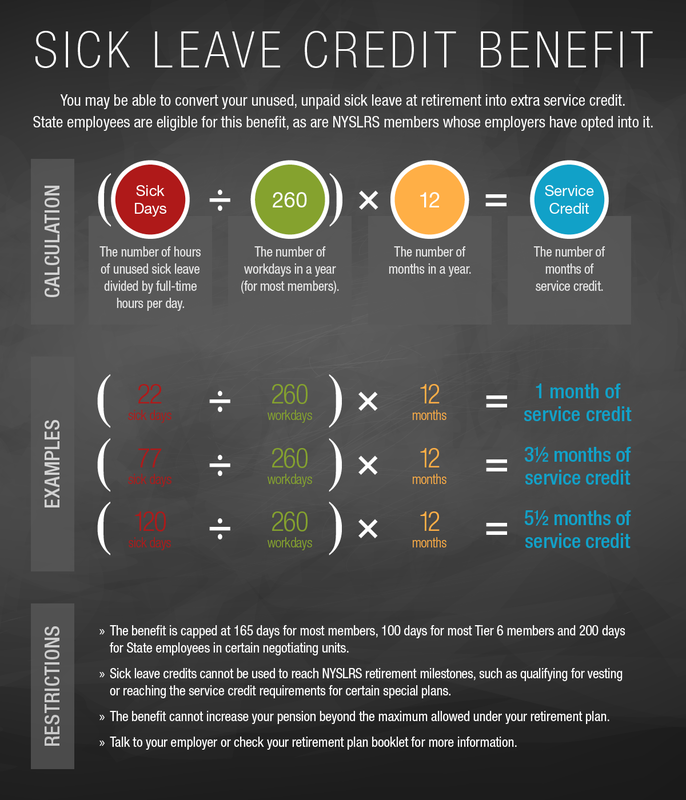 Your additional service credit is determined by dividing your total unused, unpaid sick leave days by 260. Most ERS members can get credit for up to 165 days (7½ months) of unused sick leave. The benefit is capped at 100 days (4½ months) for most Tier 6 members. State employees in certain negotiating units may be able to use 200 days (about nine months). Those extra “months” would be used in calculating your retirement benefit. Also, depending on your employer, your unused sick leave may be used to cover some health insurance costs during your retirement. Please check with your employer for information about health insurance. Unused sick leave cannot be used to reach NYSLRS retirement milestones. Let’s say you have 19½ years of service credit. At 20 years, your pension calculation would improve substantially. You also have 130 days of unused sick leave. Can you add the six months of sick leave credit to get you to 20 years? No. Retirement law does not permit it. You’ll have to work those extra six months to get the 20-year benefit rate, though sick leave credits can still be used in your final pension calculation. Check your retirement plan booklet for more information. Content last revised November 3, 2017. This entry was posted in General News, Members and tagged ERS, Information is the Key, know your benefits, Member Annual Statement, members, NYSLRS, PFRS, retirement, retirement age, Retirement Milestones, retirement plan, retirement planning, Service credit, sick leave, sick leave credit, unused sick leave, vesting on July 12, 2017 by NYSLRS. 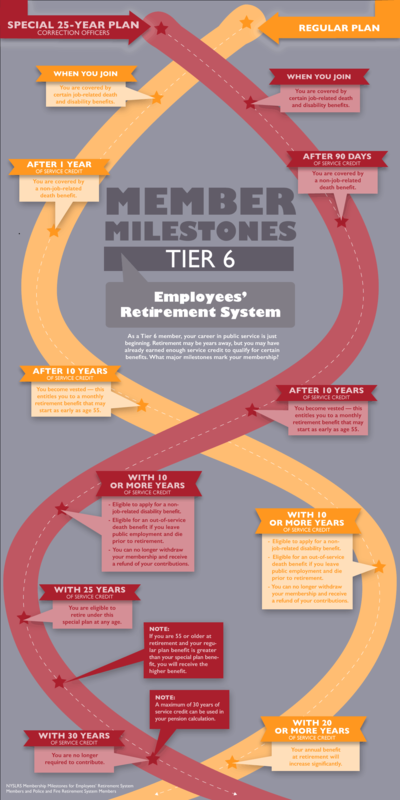 Tier 6 members (those who joined NYSLRS since April 1, 2012) are eligible for a lifetime pension benefit with 10 years of credited service. And that pension can replace a portion of your salary throughout your retirement. 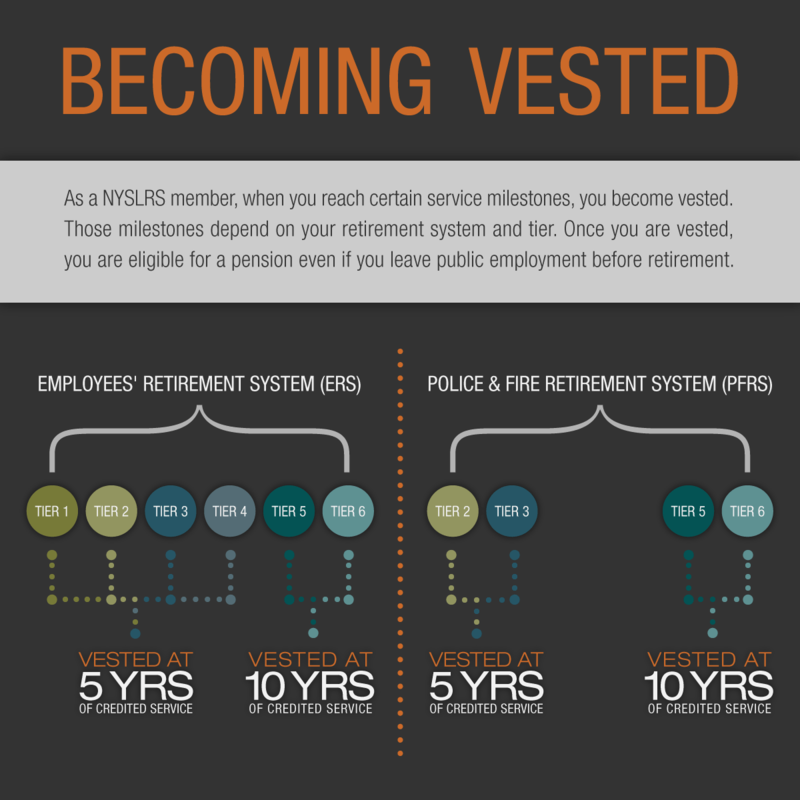 Your NYSLRS pension will be based on your Final Average Salary (FAS) and the number of years you work in public service. 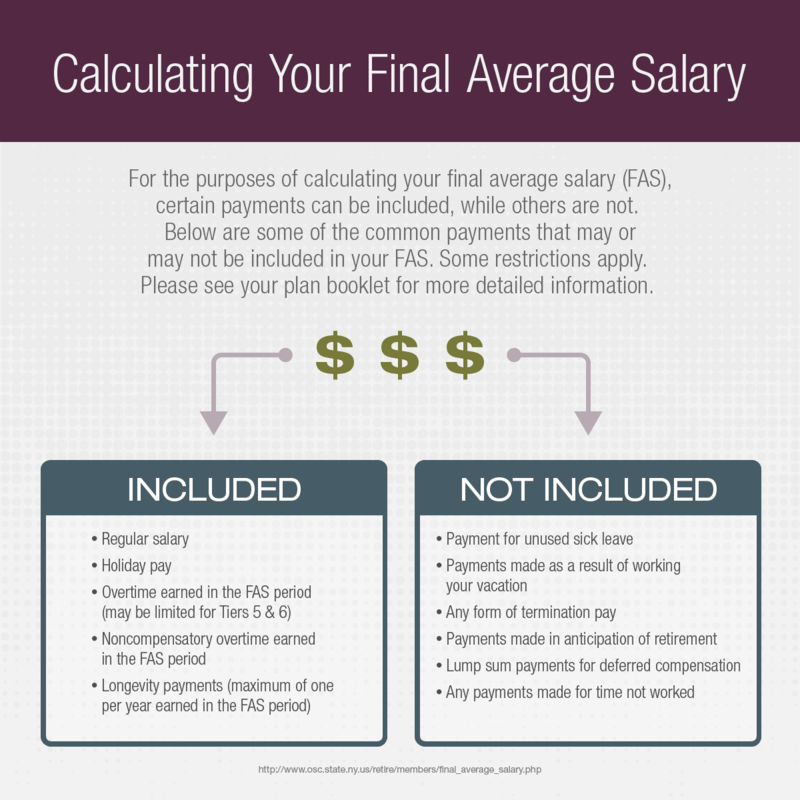 FAS is the average of the five highest-paid consecutive years. For most members, those higher-paid years come at the end of their careers. Since retirement is still some years in the future for most of you, we won’t focus on the dollar amount of your FAS today. But we can look at what percentage of that salary would be replaced by your pension if you continue in the system until retirement age. 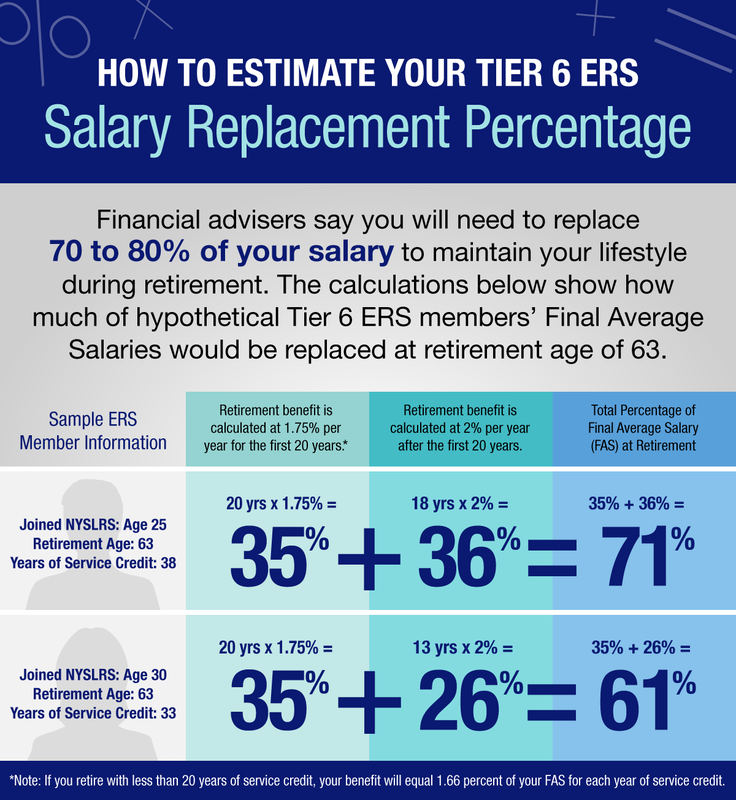 For Tier 6 members of the Employees’ Retirement System (ERS), the benefit is 1.66 percent of your FAS for each year you work, up to 20 years. 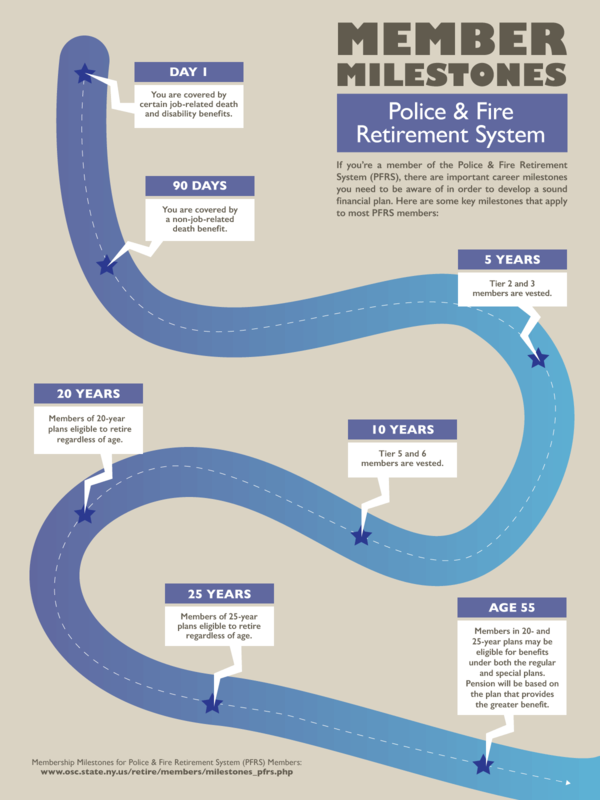 (Benefit calculations for members of the Police and Fire Retirement System vary based on plan.) At 20 years, the benefit equals 1.75 percent per year (for a total of 35 percent). After 20 years, the benefit grows by 2 percent per year. Financial advisers say you will need to replace between 70 to 80 percent of your salary to maintain your lifestyle during retirement. Let’s see how we can get there. NYSLRS Pension: Say you begin your career at age 30 and work until your full retirement age of 63. That’s 33 years of Service Credit. 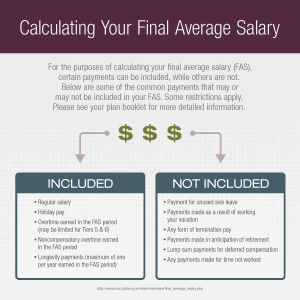 You’ll get 35 percent of your FAS for the first 20 years, plus 26 percent for the last 13 years, for a total benefit that would replace 61 percent of your salary. 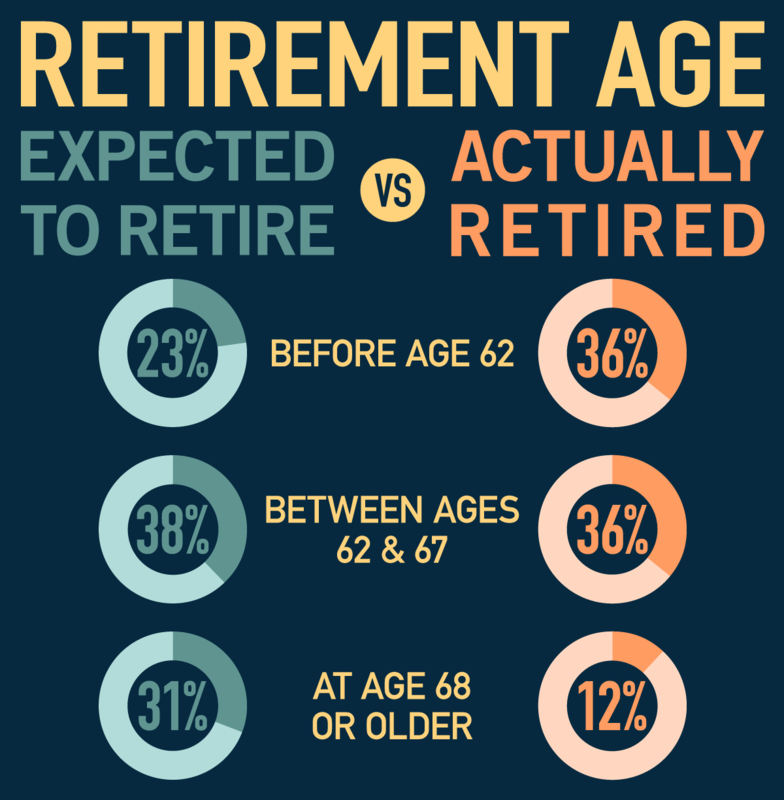 If you started at age 25, and continue till 63, you’d get 71 percent of your FAS. If you didn’t start till age 35, you’d still get 51 percent at 63. Social Security: You also should factor in Social Security. We know, you may have heard that Social Security might not be there for you, but the situation isn’t that dire. According to the Social Security Administration, under current law, payroll taxes will cover about 79 percent of benefits by 2034. Social Security now replaces about 36 percent of the wages of a typical worker who retires at full retirement age. So even if benefits take a hit – and that’s a big IF – Social Security might still replace around 25 to 30 percent of a typical worker’s pay. Savings: Retirement savings can also replace a portion of your income. How much, of course, depends on how much you save. The key is to start saving early so your money has time to grow. If you haven’t already looked into the New York State Deferred Compensation Program, please consider doing so now. Content last revised July 31, 2017. This entry was posted in General News, Members and tagged benefit reductions, benefits, defined benefit plan, ERS, FAS, Final average salary, Information is the Key, know your benefits, members, New Members, New York State & Local Retirement System, New York State Deferred Compensation Plan, NYSDCP, NYSLRS, personal savings, Personal Savings Plan, PFRS, Preparing to Retire, retirement, retirement age, retirement plan, retirement planning, retirement security, salary replacement, Service credit, Social Security, Tier 6, Vested, vesting on July 5, 2017 by NYSLRS. 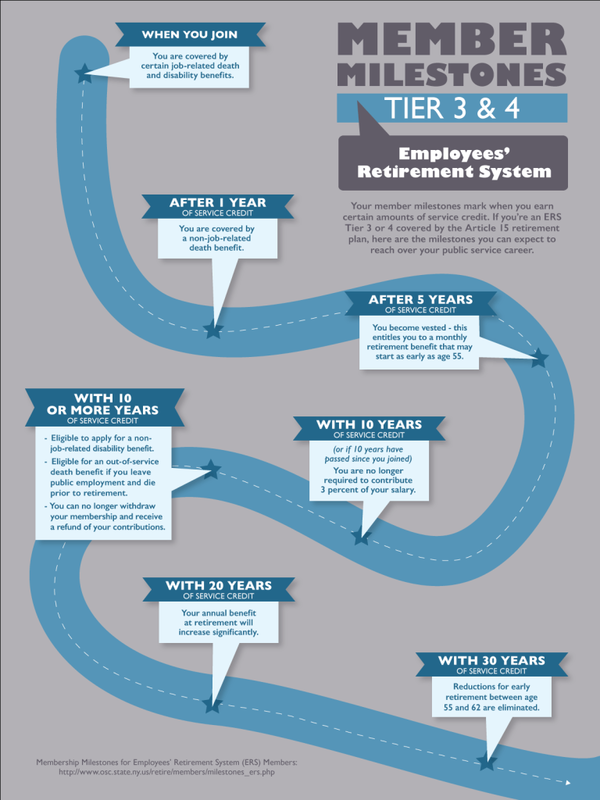 When you join the New York State and Local Retirement System (NYSLRS), you’re assigned a tier based on the date of your membership. 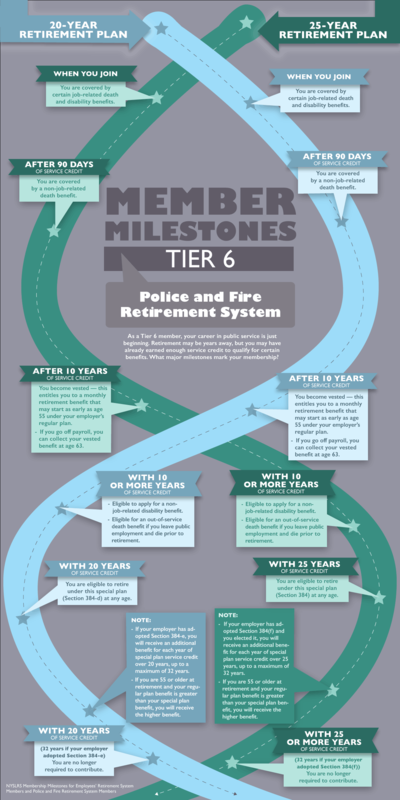 There are six tiers in the Employees’ Retirement System (ERS) and five in the Police and Fire Retirement System (PFRS). Each tier has a different benefit structure established by New York State legislation. 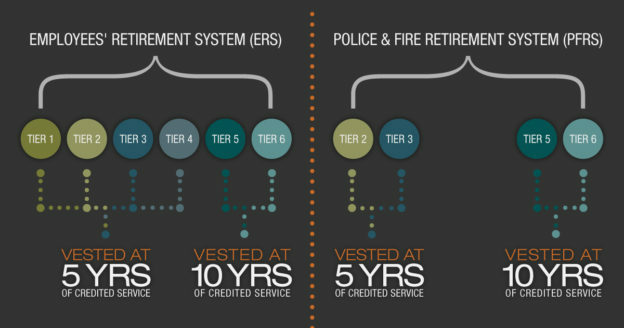 Our series, NYSLRS — One Tier at a Time, walks through each tier to give you a quick look at the benefits in both ERS and PFRS. Content last revised October 26, 2017. This entry was posted in General News, Members and tagged beneficiary, defined benefit plan, FAS, Final average salary, Information is the Key, know your benefits, member contributions, members, New York State & Local Retirement System, ny, NYSLRS, One Tier at a Time, PFRS, PFRS Tier 5, police and fire retirement system, Preparing to Retire, retirement, retirement age, sick leave credit, Tier 5, Vested, vesting on October 21, 2015 by NYSLRS.